Production of the latest Nissan Micra has begun at Flins in France and, according to Nissan, final checks have ensured the vehicles are finished to the “highest quality”. Deliveries to Nissan retailers and customers will commence from mid-February in key European markets, and from March in the remainder. The start of production (SOP) marks the beginning of a new chapter in a success story which stretches back more than three decades. First launched in Europe in 1983, Micra is one of the world’s most recognisable model names with global sales of more than seven million cars. This all-new version – the fifth generation – sees it return to the heart of the European B-hatchback segment. The latest Micra is manufactured at Flins, France, at a plant operated by Nissan’s Alliance partner Renault. 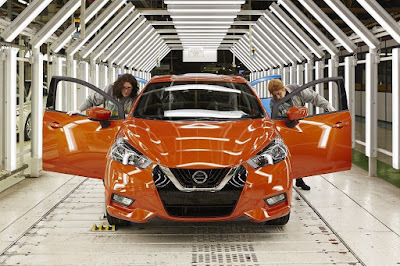 It is the first Nissan passenger car to be built in a Renault plant in Europe, and returns Micra production to Europe – close to its key customer base – after a break of seven years. It is being built on a modified version of Nissan’s V-platform. Flins, to the west of Paris, is a factory with experience in producing hatchbacks for the European market. First opened in 1952, the 237-hectare site is the longest-established car-producing plant in the Renault Group. It is currently home to the Renault Clio and Renault Zoe models. This ‘cross-production’ of vehicles is a major driver of manufacturing synergies for the Renault-Nissan Alliance, and the alliance claims it brings several key benefits to the business and to the customer. It also maximises the advantages of the Alliance Production Way, a manufacturing and shop-floor management system common to Renault and Nissan. As well as allowing plants to make "better" use of their production capability, this system takes benchmarks and best practice from both brands to ensure the highest quality production standards are met and maintained. Nissan claims Micra is “a revolution”. It says it is a radical progression from the model it replaces, and from the trio of highly successful superminis which date back to the Micra’s debut in Europe 34 years ago. Well, one would certainly hope so. The vehicle is longer, wider and lower than before. It has been conceived, designed and engineered with European customers’ requirements at the top of the agenda. Nissan says that key to its appeal is the car’s “athletic and expressive exterior design”, which moves the Micra name plate in a “daring new direction”. The contemporary look and premium feel continues inside, with a high-quality cabin that boasts two-tone soft-touch materials as standard across the range. Nissan marketing people see the Micra as a “technology leader”, with a number of features which are not only new to the Micra but new to the segment. These include Intelligent Lane Intervention, a safety system which gently corrects the Micra back on to the right path should it be required. Nissan’s marketing staff also see it as “the perfect balance between agility, excitement and the secure feeling that comes with confident and predictable handling”. Three engines are available – two gasoline and a diesel.